Art has indeed no boundaries. It can be seen and observed anywhere and by anyone. For the conventional artists, pencils, pens, paint brushes, chisel or in the case of graphic artists – their computers are the most common tools for creating their master pieces. But for an artist to use a surgical scalpel on his work is pretty rare even for the eclectic bunch of designers, artists and sculptors in the creative community. Spanish artist Lorenzo Duran Manuel Silva is one of these rare finds who uses a scalpel in carving out his designs. 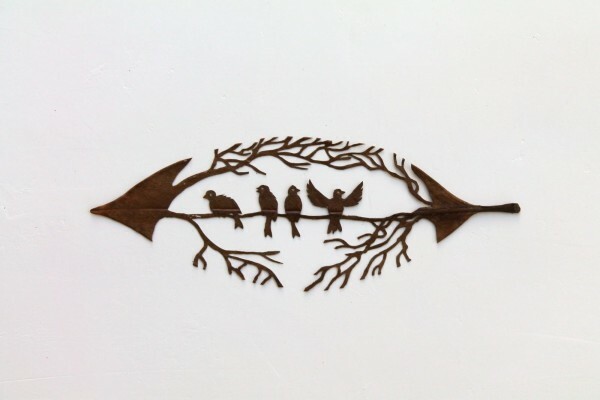 And to make his craft even more unique than most artists, his medium of choice is somewhat uncommon for use to even ordinary people – dried leaves. Lorenzo was born in 1969, in Cicares, Spain but grew up in Germany until he was 8. He then moved to Madrid where he settled there for the next 25 years until finally moving to Guadalajara. Although Lorenzo didn’t have formal education in the field of arts, his natural inclination towards the realm of creativity fueled his passion for learning different art disciplines such as painting and sculpting. In fact, just unlike other artists, Duran’s passion for the arts took a back seat in his professional career while he looked for ordinary jobs, specifically in the construction industry. However, he eventually succumbed to his heart’s desire and discovered he wanted to make a living doing something that he really loved. It was then the time that he started painting and submitting pictures to various competitions. Duran enjoyed moderate success in this endeavor, but all that changed when he had his big light bulb moment when one day he saw a caterpillar eating a leaf, which made him realize the potential of leaves to become a viable medium for his next artistic project. Since then, Lorenzo has slowly but surely developed the technique that has now granted him positive feedback from the creative community. Lorenzo further honed his technique by studying different styles of paper cutting from different cultures such as that of the Kirigami of the Japanese and the scherenschnitte of the Germans and the French. Furthermore, through continuous experimentation and practice, he was able to identify specific species of plants that are easier to work with and produces the best results. He has also established a somewhat proven process of creating his leaf-crafted art which involves raking the leaves, washing, drying, pressing them and finally making the cuts. And there you have it guys. The next time you rake the leaves from your yard, remember that somewhere in Spain, there is a man that creates unbe-leaf-able works of art from these organic canvases of nature. Do you find this type of artwork amazing? Share with us your thoughts by leaving a comment below. You can also drop a message on Facebook, Twitter, Pinterest and Google Plus or subscribe to our blog for more design news, features, inspirations and freebies from our creativity factories.